BISHKEK, Kyrgyzstan -- In August 2014, Manas Mambetov, a senior lieutenant in the Kyrgyz Army reserves, arrived in eastern Ukraine on a moral quest to fight "fascists." A week ago, he returned home, accompanying the sealed coffins of two fellow Kyrgyz soldiers and disillusioned by his experience. "These aren't conscript soldiers," Mambetov says, adding that they were "battle-ready units" who fought in the wars in Chechnya and in Georgia's separatist South Ossetia region. European and U.S. leaders and NATO officials have said there are thousands of Russian military troops fighting in eastern Ukraine. Moscow denies the accusation, saying the fighters there are locals and volunteers from across the former Soviet Union. Mambetov, says he was one such volunteer. "I was watching television -- Channel One, RTR, and others," he tells RFE/RL's Kyrgyz Service, referring to Russia's main state-run channels. "It was symbolic for me because my grandfather was killed in the war in 1941. My moral principles were guiding me. The television channels were showing swastikas, fascists raising their heads there, Nazis." But after he arrived in Ukraine's Luhansk region, Mambetov found a different situation. "I thought that there were fascists there," he says, "but I didn't see any. We fought against the regular Ukrainian Army. They had some questionable elements -- the Right Sector battalion and the Donbas battalions, which are composed of volunteers, ultranationalists. But I didn't see any fascists. "I had one motive and it wasn't supported by anything", he adds. "It turned out that everything was agitation, propaganda. This was really offensive to me." "I fell for their story," he adds. Mambetov says he made his way in August 2014 from the Kyrgyz capital, Bishkek, to the southern Russian city of Rostov-On-Don, from where he crossed into Ukraine at the Izvarino border checkpoint. After five days during which his military-service and other documents were checked, he was sent to a reconnaissance unit commanded by a man from the Russian city of Kaliningrad using the nom de guerre Che Guevara. He was paid $1,500 a month, with bonuses for destroyed tanks and other heavy equipment. He says it was widely accepted there that the separatist forces are completely controlled by Russian military advisers. Separatist fighters believed that Viktor Penner, economic adviser to Luhansk separatist head Igor Plotnitsky, was in direct contact with Kremlin presidential adviser Vladislav Surkov. Moreover, the forces in Luhansk are riven by infighting, with many units refusing to obey orders from Plotnitsky. Mambetov says he participated in a punitive action against one recalcitrant unit in which 17 men were killed. 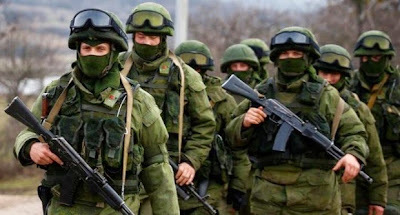 In recent months, Mambetov says, the separatist forces have been increasingly augmented by Russian troops and equipment. Heavy weapons are brought in from Russia under cover of darkness and stockpiled in warehouses that have been cleared for that purpose. "The old miners aren't around anymore," he says, adding that there are fewer volunteers like himself as well. "Now they are being replaced by regular forces. Their mission is to hold on -- not to surrender any positions under all circumstances." He says these people will not accept "special status" for the Donbas within Ukraine, as stipulated in the February peace agreement negotiated in Minsk, for fear of reprisals by the Ukrainian security forces. As a result, many are already leaving and the ones that remain feel "they have to fight to the end -- there is no other choice."